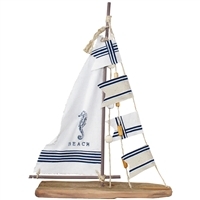 For those looking to get a “beach house” theme for their home or shop, nothing quite says fun at the beach like nautical décor accents. 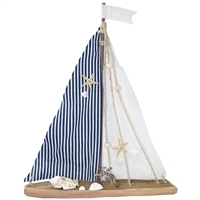 World Buyers has a wide selection of wholesale coastal-, marine- and beach-themed décor that your customers will love! Whether you’re looking to offer décor for living areas or outdoor spaces, you’ll be able to find exactly what you’re looking for. Shop our wide selection of trays, jewelry dishes, kitchen accessories, paperweights, tea light holders, wall art, driftwood and more, all at great wholesale prices. Find the biggest selection of wholesale beach décor with World Buyers today! 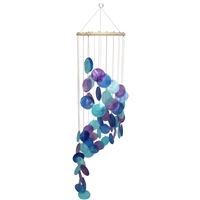 Capiz shell chimes create relaxing island sounds that everyone enjoys! 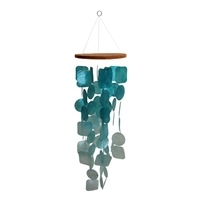 Beautiful blue gradient capiz shell chime. 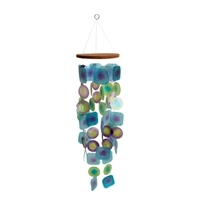 Multi-color capiz shell chime with cool and calming ocean colors. Pretty blues and purple discs arranged in attractive spiral. Hear the island sounds chime softly! Exclusive WB design! Each box has 50 matches with colored tips. 1 dozen boxes. Matches ship to continental USA ONLY. No Canada or overseas shipments. Whimsical Mermaid wall hook. Antiqued white metal. (Screws not included). 6 pc minimum. Must order in increments of 6. Gilda ceramic mermaid box. Topped with adorable gold metal mermaid. Lovely mermaid with shell tray finished in white with aging accents. Poly-resin. White metal nautilus shell tray. Gildy ceramic mermaid box. Topped with adorable gold metal mermaid. Find great wholesale marine and beach gifts and decor at World Buyers. Huge selection with lots of themes, including trays, paperweights, and much more. Find popular driftwood gifts and decor too.